After the DAX failed to hold above 11,800, Friday’s bearish engulfing candle saw the index break beneath its bullish channel and prior swing low. With the bias remaining bearish beneath Friday’s high, we see its potential to head towards 10,900. We outlined the two scenarios for the DAX in our prior analysis, CAC, DAX Could Make Quite The Pair and price action is now playing in line with the bearish bias. We wanted to see a clear break above the 11,800/50 area before becoming bullish. And that filter has allowed us to avoid the false break above its 200-day eMA last week. Moreover, Friday’s bearish engulfing candle closed beneath the bullish channel, 50-day eMA and prior swing low to suggest further downside could be ahead for the DAX. 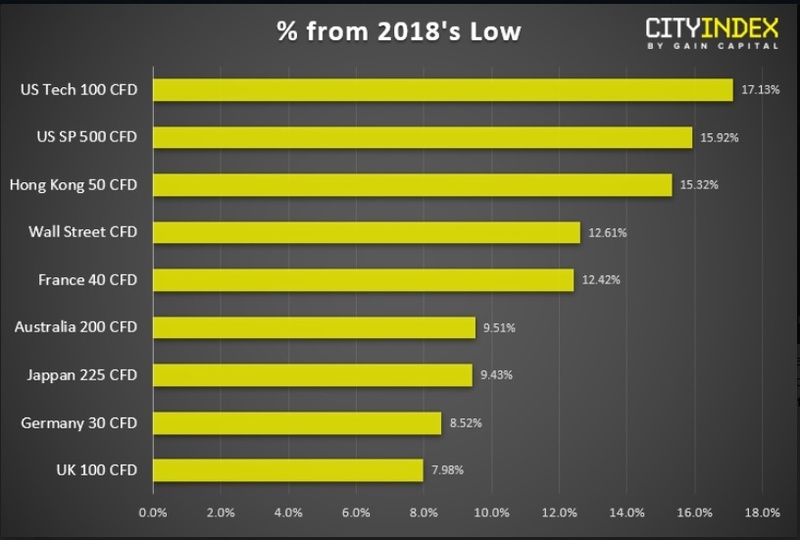 Compared to most of its peers, the DAX has been one of the weaker performers during this year’s recovery, only being underperformed by the FTSE. Up just +8.5% from the lows, its clearly struggling to keep up with the US counterparts. Therefore, if we are to see widespread weakness from equity markets, DAX is theoretically a better short than the strong performers. And with bond yields weighing on sentiment, it’s plausible that we could be about to embark on another leg lower across equity markets.